Fragrant Footings- Step Into True Luxury! Bring fine essential oils to your feet – straight from the garden. Each time friction takes place, our step-to-release technology transfers to your feet microscopic bursts of the finest dry scents. 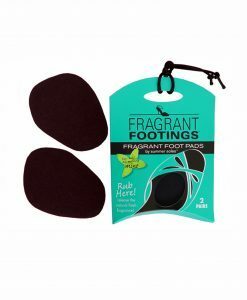 So your feet get an awesome kick of fragrance – not the room! Dermatologist tested. Hypoallergenic.